One of my previously undocumented resolutions for 2011 was to try as many new restaurants as possible (within reason). Often I find that I will ask around, walk around, or go to the internet to try and locate a restaurant that is a good fit for me. Thanks to the kind folks at Urban Spoon (who listed off the top ten restaurants in Mississauga) I was able to locate and get friends excited about Mickey's Pizza. While returning to town on Saturday afternoon it felt like the perfect opportunity to check it out. Upon ordering and waiting for the pizza to be completed, the staff chatted with us and introduced some of the background and methodologies of the restaurant (including their unique oven), as well as the menu. Extremely pleasant and welcoming experience, hopefully the pizza is too. After the quick 15-minute wait, the pizza was ready to be devoured and I am pleased to say that it was absolutely delicious. I have been to Chicago numerous times, been to Hamilton, and I am so happy to know that there is a solid pizza place so close to home (especially one that has solid deep-dish AND traditional offerings). The only drawback of this arrangement I have discovered is that I don't plan on eating deep-dish that frequently, so it's like being in a long-distance relationship with the perfect girl that you only get to see once in awhile. There's always the extremely satisfying traditional ones. We were fortunate to try one of the thinner pizzas upon exiting (thank you very much) and just like the deep-dish, it was amazing. I am clearly blown away. One of my favourite parts of the experience, in addition to the incredibly friendly staff, was being able to see the preparation of my meal. Much like Burrito Boyz, the toppings are all on display and added to the dough for one to see and placed into the oven. Depending on which type you get, the traditional pizzas are placed on the Hickory VPO Barbecue Oven so that one can see their raw meal enter and reach the finish line all before their eyes, pretty neat. All in all, excellent experience and I will certainly return. I have mentioned it to friends already and have heard some surprises at the "no slices" offering, but it will make perfect sense upon visiting. This isn't Pizza Pizza; your meal is made from scratch in front of you and obviously they're not going to make one slice or have their pizza sitting around all day. I'm in serious like. Me: (to neighbour) "Hey! 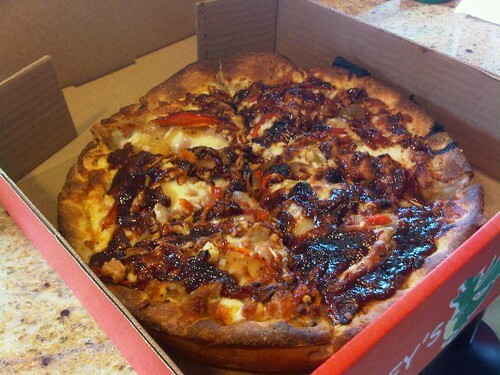 Just went to Mickey's Pizza; it's out near Lakeshore and Erin Mills, amazing pizza!" Him: (eating Pizza Pizza) "Well, I have Pizza Pizza, it's all the same. Pizza's pizza." No... all pizza is not alike. The Food Junkie was actually the first review I saw on the place and if my brief overview didn't sell you, perhaps she will. Seriously, game changer. Turns out we're returning this weekend with a group of friends. I also didn't mean to pick on Pizza Pizza, it was the first big chain that came to mind. EDIT: Forgot but I also had a Coke out of a glass bottle during the meal, nice touch! I like music, food, travel, sports, and some other stuff.